My, would ya look at that drop on Cable. Now it looks like the dollar’s rally seems to have stalled at 1.5700, a major psychological handle. However, I think that the GBP/USD sell-off is still far from over and I may just get a chance to short the pair on a pull back! Using the Fibonacci retracement tool, we see that the area between the 50% and 61.8% levels coincides nicely with the previous support area at 1.5800. 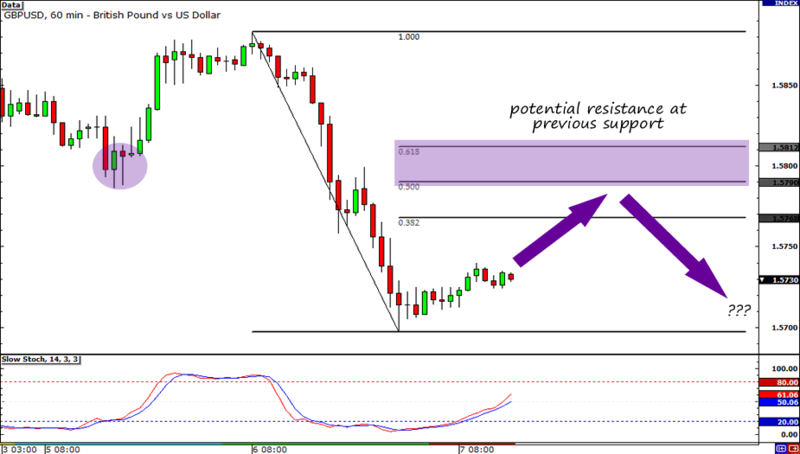 I’m planning to short GBP/USD when it finds resistance around the area. That is, if reversal candlesticks materialize. If I do decide to jump in on the dollar rally, I’ll probably place my stop somewhere around 1.5850, well above the 61.8% Fib level. As for my profit target, I’ll be aiming for 1.5700. Whatever I decide to do, I will be sure to update you guys. Besides the technicals, there are also a couple of fundamental reasons that made me sell the pair. For the past three days risk aversion has been the dominating market theme. This seems to be the result of the uncertainty surrounding the bond swap deal that will occur tomorrow in the euro zone. Needless to say, this has triggered a lot of safe haven buying. Also, yesterday, the Halifax House Price Index (HPI) came in worse than expected with a 0.5% decrease. The Bank of England (BOE)‘s interest rate decision will be released tomorrow. While the market isn’t expecting any change in interest rates, the BOE could say some bearish things in the accompanying statement. Their quantitative easing program is going to expire this March, and they could hint at another one soon! That’s my trade idea for today! Hope you like it!